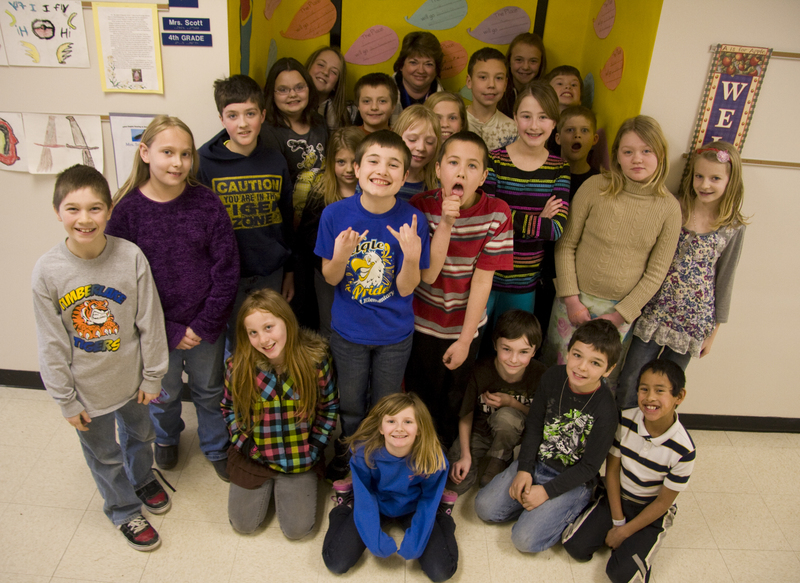 Fourth-graders from Athol Elementary celebrate completing the Coeur d’Alene Press’ Design an Ad program on March 5. Blake Garcia, a fourth-grader at Athol Elementary, could not get Carrie Underwood out of his mind. All he could think about while at school was the glamorous country star and how he’d be hearing her sing live that very night in Spokane. So when Coeur d’Alene Press representatives Nicole Choquette and Tiffany Morrett presented the Design an Ad program to him that day, it was no surprise the first person he wanted to design an ad for was Carrie Underwood. Unfortunately for Blake, the country star was not one of the advertisers his class was commissioned to create an ad for in the Coeur d’Alene Press’ Design an Ad Contest, which challenges elementary through high school students to individually apply classroom lessons to the real world by designing their own ad for a North Idaho business. This year, 1,800 students like Blake participated in the program, drawing support from 28 schools, 47 teachers and 105 businesses. Pizza parties offered to every participating class as well as three cash prizes (1st place- $200, 2nd place- $100, and 3rd place- $50) also provide students a real-world incentive. Bryson Mari, another fourth-grader in Danielle Scott’s class, was at first more excited about the free pizza party than the assignment. Danielle Scott could see the program’s results in her students. Every student is given the opportunity to make his or her own contribution to that business, the advertiser, and the greater community through the Coeur d’Alene Press. Grace Gregory, 9, was particularly excited about drawing pictures and looking up information for her ad. “It was really fun, and yes, I totally learned something,” Grace said. Last week Danielle Scott spoke to her students about the importance of direction in deciding one’s career field. The greatest lesson most kids learn isn’t something they expect, she said.